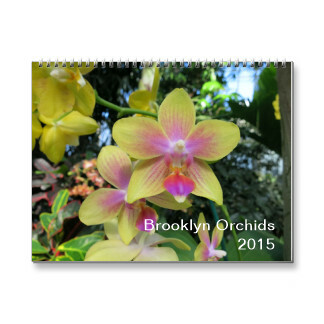 Good news, orchid lovers: the 2016 Brooklyn Orchids calendar is now available in my Zazzle store! This calendar includes original orchid photography by yours truly (the exception being the cover/June photo, which was taken by my husband). Most of the photos were taken at this year’s New York Botanical Garden Orchid Show, but a few are from our visit to Florida. The 2016 calendar is even more special to me, because for the cover page I chose to feature the first orchid I ever saw in the wild. This 12 month, full color calendar costs $23.05 on my Zazzle store. Zazzle currently has a promo code SANTASCOMING that gets you 20% off all orders, but it’s only good through midnight tonight (Pacific Time). So if you want to get a discount on your 2016 Brooklyn Orchids calendar, now’s a good time to do it. I imagine Zazzle will be doing some more sales in the near future too, what with Black Friday, Cyber Monday, and all the other holiday craziness coming up. Thank you in advance for your support, and I hope you enjoy!